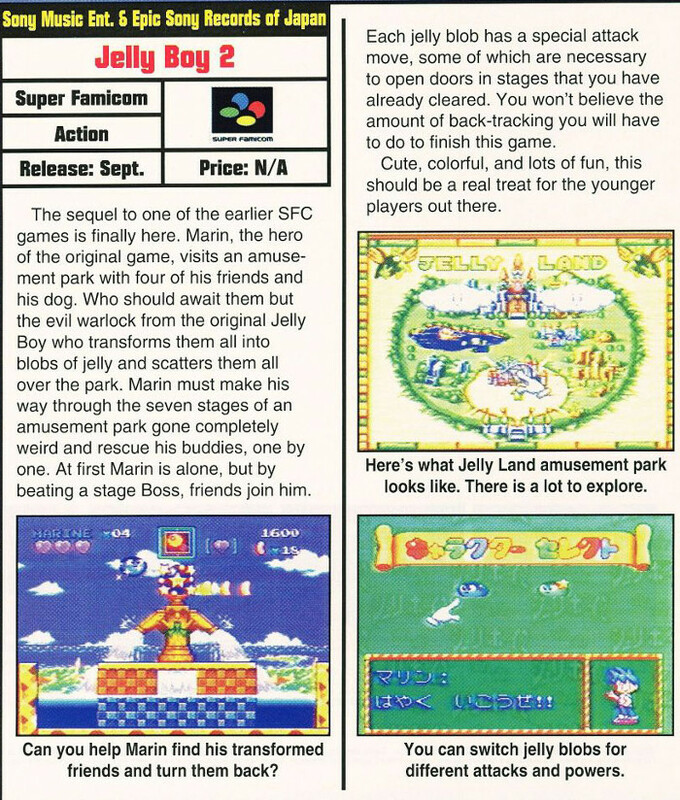 Jelly Boy 2 is the unreleased sequel to Jerry Boy/Smartball, developed by Game Freak and published by Sony. 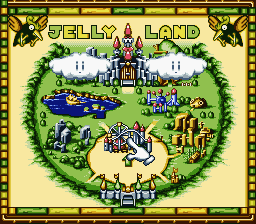 One of the oddities of the SNES era is the large amount of games with "jelly" protagonists. 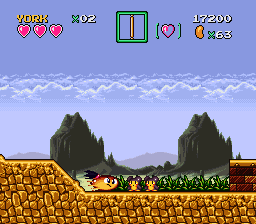 The first was Jerry Boy (known as Smartball in North America), a cute platform game made by Game Freak, who of course are best know for making Pokemon. 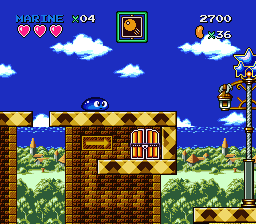 After that, there were a bunch of other similar games, like Claymates, Super Putty and the completely unrelated Jelly Boy released by Ocean. 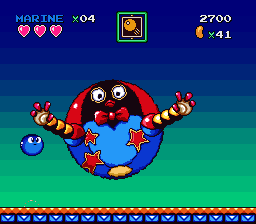 Since the SNES was the golden era of the platform game genre, it was pretty logical that a sequel to Jerry Boy would be made, this time with a less Engrishy title, Jelly Boy 2. Back in 1994, Sony and Nintendo's relationship was not great. Nintendo abandoned Sony in favour of Philips for their ultimately canned SNES CD add on. As a result, Sony decided to make their own console, the PlayStation, which was released at the end of 1994. At around the same time, Game Freak was developing Pokemon, in association with Nintendo. 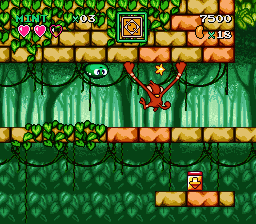 Jelly Boy 2 is a largely complete action/platform game that improves on its predecessor in pretty much every way. Like the original Jerry Boy, a wizard transforms the main character Marine into a jelly creature. This time, the wizard also transforms his four friends and their dog as well. I played through the game, and there is nothing truly broken, with the exception of one character's special move not working (the girl with a bow in her... blob), which was apparently supposed to allow the character to swim better than all the others. Since it doesn't work, using that character is pointless. 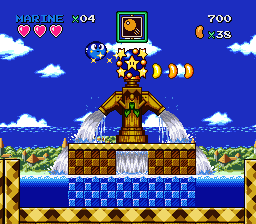 Each stage has five levels. 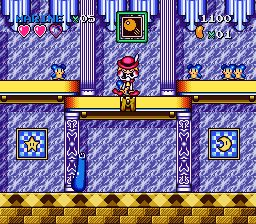 At first, you can choose between five different stages to save all your friends, then you gain access to three other stages with considerably ramped up difficulty. 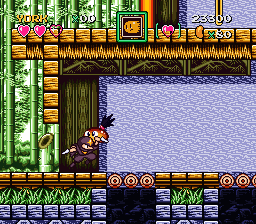 This game is similar to Donkey Kong Country 2, in that there are secret rooms that you must find to get the ultimate ending. It is a fun game, definitely a good way to kill a couple of hours. 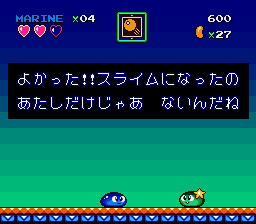 One thing to note is that the text in the game is in Japanese. The only other unreleased Super Famicom games that have leaked out are Star Fox 2 and Sound Fantasy. All others are unreleased localizations or North American/European developed games. KingMike's Translations and Chris Covell created a patch that translates all the text. 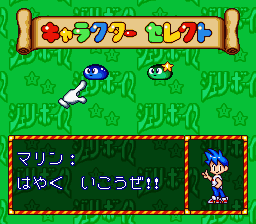 Unlike Jerry Boy, this isn't really a story driven game, but it allows you to understand the ending (if you don't know Japanese). 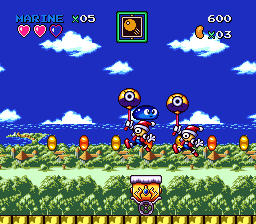 The levels themselves have no text, so it isn't a barrier to playing the game. 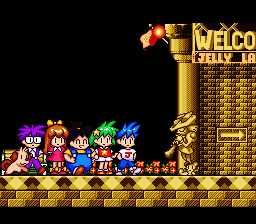 Jelly Boy 2 is a top tier SNES platformer, and it is a shame it was never released. I had a lot of fun with the game, even if the controls are not perfect (particularly when swimming, or trying to get off vertical walls). The characters give a lot of variety in how to play the game, and there are a number of secrets to find. Give it a try. Cart stage First mini-boss, attack of the flute player that attracts mice! Saving Mint - "Awesome!! Well, I have become a slime. Not cool!" Marine: "Quickly, let's go!" 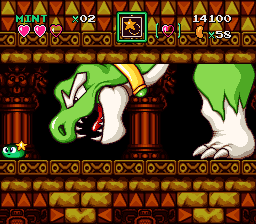 Mint uses a star boomerang as her special skill Dinosaur boss, probably the easiest boss in the game.